Category Archives: Are you a Prop Desk/ Broker/ Sub-Broker/ Institutional Broker/ Active Trader? It is a great pleasure for us to invite you to attend our Webinar on launch of our BracketOrder Strategy on Presto, Symphony’s futuristic Algo Trading Platform. Webinar Date: Monday, 30th May 2016. Symphony invites Strategists with proven strategies for Indian Exchanges. If you have matured intelligent strategies for PropDesk, HNIs or professional traders, Symphony will provide easy to use, well documented Presto APIs to suit your applications and Free development and testing environment. Symphony will also give you access to visionary Stock Brokers and traders to use your strategies. FinBridge on 15th March 2015 invited panelist to discuss Algo Trading in India for Active traders. An interesting discussion to give insight on the current status and how one can adopt Algo Trading as a beginner. Presto Managed Futures Portfolio (MFP) helps Asset Managers to profitably administer Futures & Options based portfolios for their valued clients. Asset Managers can leverage unique features like ‘Auto Roll Over’, Client Management, Automatic order placement for multiple clients etc. 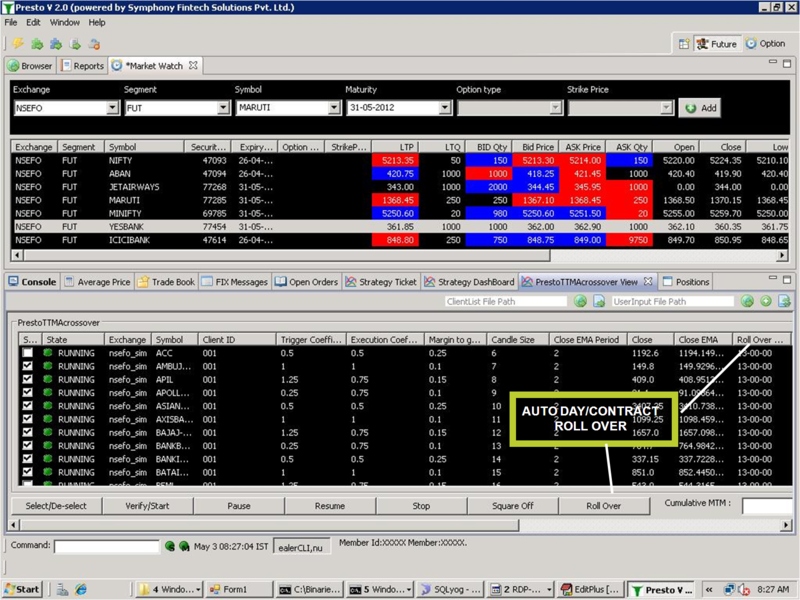 Buy/Sell Triggers can be generated from custom developed algos or 3rd-party tools, and then automatically routed to MFP. Mumbai — July 12, 2012 — Symphony Fintech, a provider of Algorithmic Trading Systems, today announced that NSE has approved an Algo-Presto with Trade Tiger-MAcrossover for use by Sharekhan. The algorithm works in coordination with Sharekhan’s Trade-Tiger front-end. Symphony had worked for very closely with Sharekhan tech team to develop & test the ‘Presto with TradeTiger’ MAcrossover Algorithm. The ‘Presto with TradeTiger’ algo addresses a common problem that sophisticated traders face in tracking positions in the F&O segment, which can be volatile as the expiry-date gets closer. The algo tracks multiple technical indicators and facilitates ready to place orders for the dealer to the exchange for optimal price/quantity. After a position is taken, the algo continuously monitors profit-taking and stop-loss parameters for an optimum exit. Special logic is applied to detect opportunistic roll-over conditions. “Symphony Fintech’s turnkey algo allows Sharekhan to offer value-added services to its clients,” said Ketan Parekh, Head of Technology, Sharekhan. “The strategy is integrated into Trade-Tiger for NSE F&O segment”. Sharekhan is India’s leading online retail broking house with its presence through 1800 ‘Share Shops’ in 550 cities and serving more than 1 Million customers across India. Founded in 2010, Symphony Fintech is exclusively focused on providing Algorithmic Trading Solutions for the Indian Capital Markets.